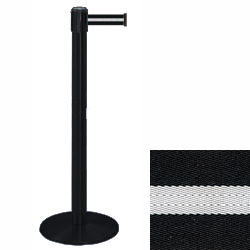 This black stanchion w/ black & white stripe belt is a sturdy crowd control system. 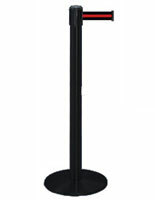 Leading the industry competition, Tensabarrier provides top quality barriers such as this post and rope fixture, measuring 38"H and weighs 24 lbs. 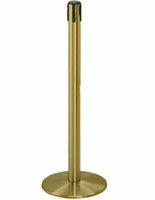 This stanchion features a 13.5"D weighted base that stays stable in high-traffic areas. 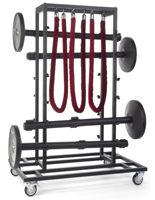 The 7.5' roping should be placed 7' apart to make this system most effective. 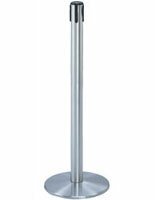 This stanchion w/ black & white stripe belt looks clean and elegant in a restaurant, hotel, movie theater, concert hall, or bar. 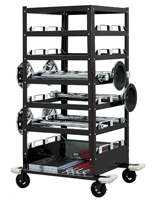 Covered with ABS plastic, the base won't scuff floors. 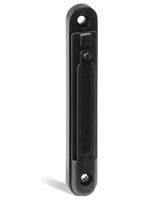 High traffic areas are best when these layout options are used: Dual Belt Posts.